Lincoln City condo: *Promo! * Oceanfront Top Floor Condo - Private Hot Tub, Indoor Pool, WiFi & More! *Promo! 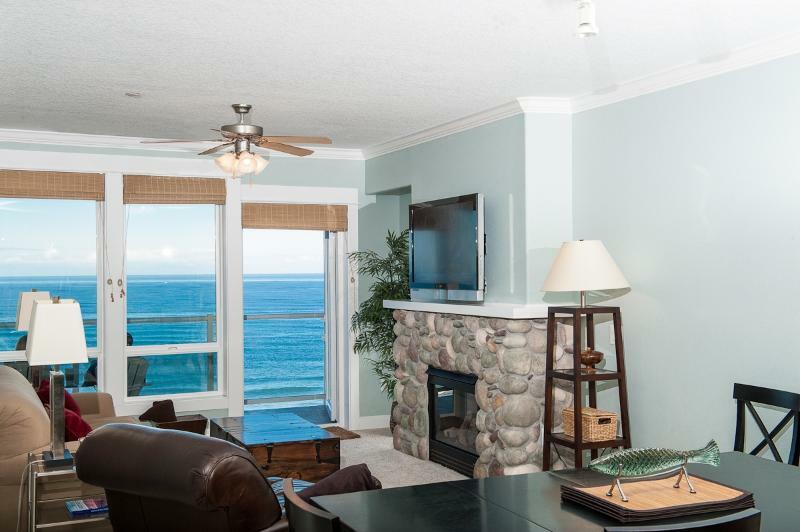 * Oceanfront Top Floor Condo - Private Hot Tub, Indoor Pool, WiFi & More! Book online by searching for Keystone Vacations Oregon using your favorite search engine! For remaining available nights through May 2nd save up to $15 off the seasonal nightly rate! Or, stay seven nights and the 7th night is free! Discounts included in quote. See Promotion Legal Disclaimer below. Due to HOA restrictions this condo cannot accommodate pets or service animals and is smoke free. Offering spectacular top floor views and a private four person hot tub, The Tides is a unique vacation experience you will not soon forget. Soon after arrival, find yourself dining on the ocean view balcony with a meal prepared in the fully equipped gourmet kitchen with stainless steel appliances. When your meal is complete, unwind on the couch or oversized leather chair next to the river rock gas fireplace and enjoy a movie or HD channels on the plasma television. After watching the sun slip beneath the waves, relax to the comforting sounds of the Pacific Ocean outside your bedroom window while finding rest on the master suite's king bed. Both bedrooms also have plasma televisions for those not quite ready for slumber. When staying at Pacific Escape, you will also have free access to Wireless Internet, the Exercise Room, Heated Indoor Pool and Game Room located at Pacific Winds. Interested in a two night stay during the months of July and August? Please call for a listing of two night stays that are available. Cleaning Fee is $70, Lodging Tax Rate is 11.3%, Applicable Booking and Damage Waiver fees may apply. Security Deposits No Longer Required! In lieu of a security deposit, a one-time Damage Waiver fee provides guests with coverage for accidental rental damage during their stay. Please call for more information about our Damage Waiver program. Rates & Fees subject to change. Please call for current rates. The Tides is a non-pet and smoke free condo. These luxury condos are located near many local destination points, like the Tanger Outlet Mall, Chinook Winds Casino, and Oregon Coast Aquarium which provide a broad variety of sight-seeing and entertainment experiences. With miles of ocean surf and sandy beaches to view from your living room, master suite and balcony, these luxuryondos are a coastal dream. Shopping, Dinning, Chinook Winds Casino, Theater, Beach and Much More! Blackfish Café, Dairy Queen, Maxwell's, Kyllos, Chinook Winds Buffett, and Much More! A car is recommend for enjoying the community and nearby attractions. Keystone communicates via email or phone. After a booking is confirmed, rental Terms and Conditions will be emailed to the guest. Check-in instructions are emailed approximately 4-10 days before arrival depending on the arrival date. We were very pleased with the entire experience. It was easy to book and easy to access. Everything was as described. The ocean view was spectacular and the private hot tub was much appreciated. The property was well-maintained. Lincoln City had great food and friendly people. We would definitely recommend this to family and friends. Very comfortable and roomy condo with fantastic views! Kitchen is large and well stocked so it gives the freedom of making fun food, eating on the deck and enjoying the view or eating out at our favorite restaurants. Loved it! This is the best and cleanest place I've ever stayed at. The view is beautiful. I will be back soon.